The following are Christian Research Network’s 2017 top 10 posts. But before we get to that, we want to thank those of you who use CRN, not just to do Research, but to start your day with our Devotion/teaching, or simply to catch up on the News. Or you might visit CRN to read an informative Opinion piece so that you’ll be up on what’s affecting/infecting the visible Church. It doesn’t matter what your reason is, we’re grateful! And because many of you share whatever happens to grab your attention, we know CRN’s on the right track! From the beginning, the aim of this blog has been to direct readers back to Jesus Christ and His life, death and resurrection for sinners, as revealed in the scriptures. Nothing will change in that regard — but other changes are definitely coming in 2018 — so stay turned! 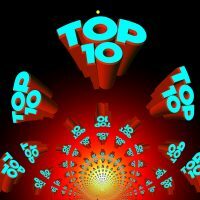 2017 TOP 10 ARTICLES WITH THE MOST HITS — some of these articles were posted several years ago. They’re still relevant today.